Liverpool manager Brendan Rodgers has criticised the treatment of Raheem Sterling as "grossly unfair". England manager Roy Hodgson claimed the 19-year-old asked to sit out England's 1-0 win in Estonia because of fatigue. Rodgers said: "It has been grossly unfair how the kid has been put on the back pages for something he clearly did not say." The Reds boss also insisted he wanted England to succeed and would help the national side. Speaking before Liverpool return to action after the two-week international break against QPR on Sunday, Rodgers denied playing any part in Sterling's request to miss the Euro 2016 qualifier. "Liverpool is a club which is very much club and country, not club versus country," he said. "People who know me well enough as a coach know Liverpool are not a barrier to England or any country." Sterling played 45 minutes of the 5-0 win against San Marino and came on as 64th-minute substitute three days later against Estonia. After the win in Tallinn, Hodgson said Sterling felt too tired to start and questioned Rodgers' claim that some players need a two-day recovery period after matches. "Things have been written which are not true," added the Northern Irishman. "Roy and I have exchanged messages but because of the busy schedules we have not been able to speak. That is fine." 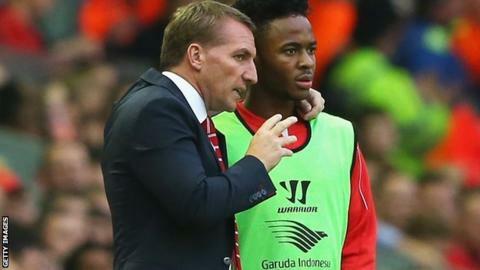 The Liverpool boss said the row had probably shaken Sterling "a little bit" but said the winger had been "brilliant in training". He added: "We want to put this to bed and concentrate on looking after a player who is a young talent who needs to be given space and protection to develop." Meanwhile, Rodgers added that it would do Sterling "no harm" to play for England Under-21s if selected for next summer's Euro 2015 tournament. He said: "Raheem is still eligible to play but I think there are a number of young players that can fit into that age group and I don't think it would do them any harm at all if they went and experienced a competition like that surrounded by top players. "If they were good enough to go on and win that tournament that would not hold back their development."